When it comes to weddings, two is always better than one! Monica and Andrew took a typical wedding and made it into an unforgettable weekend affair. 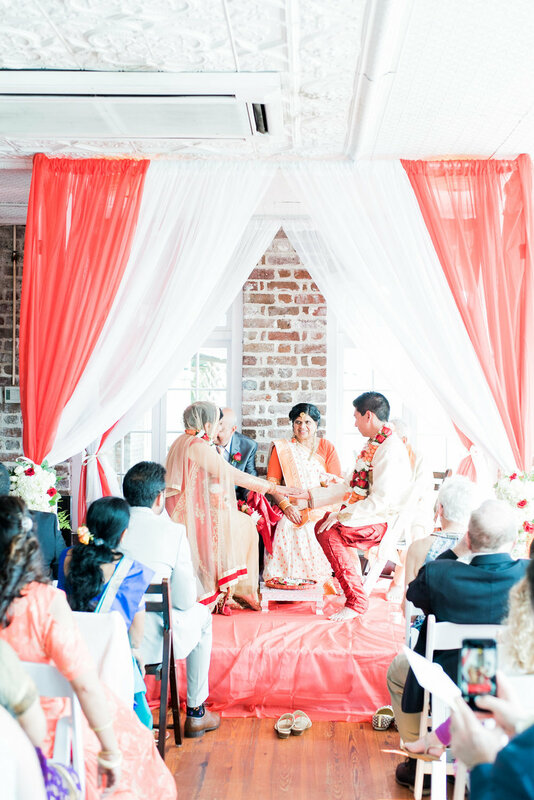 Their fusion wedding allowed their guests to experience two different cultures and traditions within one 48-hour span, and had double the wardrobes, colorful details, and receptions for even more fun. As bride Monica remembers of their wedding weekend in Charleston, "While planning a two day ceremony certainly offered its own challenges, it offered a uniqueness that not many couples (if any) get to experience. 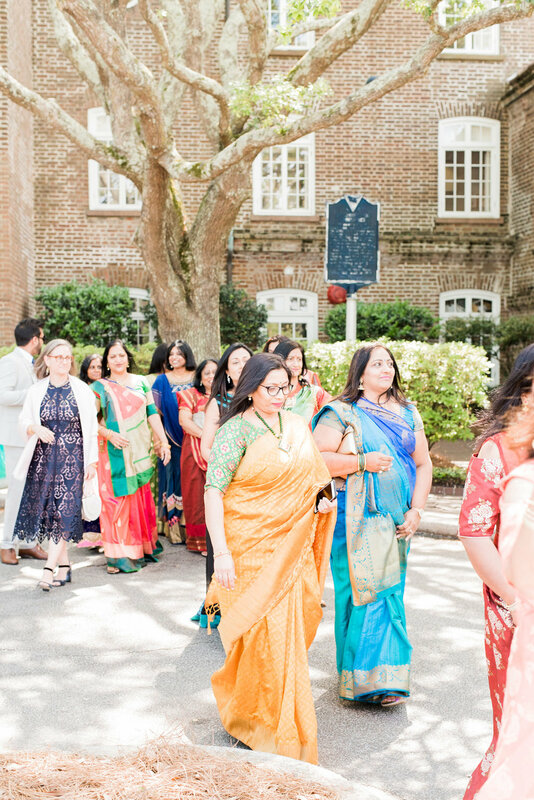 The two days offered a life changing experience not only for the bride and groom, but also for many of the attendees experiencing either their first Indian or American ceremony! "For the Indian wedding [on Thursday], the bridal bouquet was full of white hydrangeas with ivory spray red roses lightly backed with greenery. The brides side of the family had red boutonnieres and the grooms side of the family had white boutonnieres. There was swags of white hydrangeas, red roses and ivory roses with greenery on the curtains for tie-backs for the mandap (altar). The Groom arrived in a horse and carriage in a parade-like fashion with music and dancing [and] we utilized the color red [throughout the Indian ceremony]." "On Friday, the ceremony was held outside on the waterfront, on a sunny 75 degree day in beautiful downtown Charleston, SC. "For the American wedding, the bridal bouquet was coral roses with teal button mums and white hydrangeas. They were a perfect match to the bridesmaid dresses and groomsman ties and pocket squares. We had aisle vases in the first, middle and last chairs with a small vase containing a bouquet of white hydrangeas and teal button mums. The vase was tied back with a coral ribbon. The bridesmaid bouquets were white hydrangeas, coral spray roses and teal button mums. "One flower girl was carrying a small nosegay of coral spray roses with babies breath and teal button mums and the other flower girl was carrying a sign that said "Uncle Drew, here comes your bride" that was handprinted by the bride's best friend." "We met in 2005, as freshmen in college at Campbell University in North Carolina, but it wasn't until sophomore year that we started a relationship. "In 2017, Andrew's mom, and one of our best friends went to The Masters in Augusta, Georgia. Andrew had been planning to propose on these historic grounds, but the weather was showing 100% of thunderstorms, and a good chance for tornados. "Somehow, the weather cleared up just long enough for us to be allowed on the property, find the landmark clubhouse, and have Andrew propose. Shortly after the proposal, the thunderstorms came and we were evacuated. To this day, Andrew says that it was his late father who cleared the skies from Heaven for 20 minutes allowing him to ask the big question. It was an incredible day!"